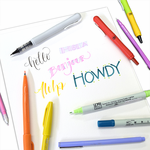 Use the Woodcraft markers to decorate or letter on a variety of surfaces. High opacity allows overpainting without bleed-through. Water-based pigment; opaque, light-fast, waterproof, odorless, and Xylene-free. 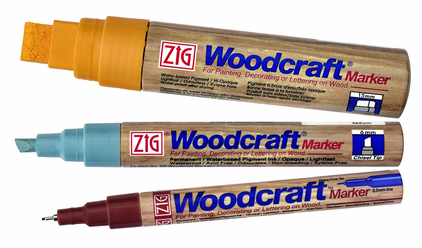 Don't let the name fool you- Woodcraft markers aren't just for use on wood! They are also very popular with chalkboard artists. The water-based ink stays on chalkboards, whiteboards, glass, and mirrors until removed with general purpose spray cleaner. Markers are made by Kuretake in Japan and are the highest quality. A variety of vivid, opaque colors are available in chisel tip, extra broad tip, and an extra fine pin-style tip for the tiniest of details.